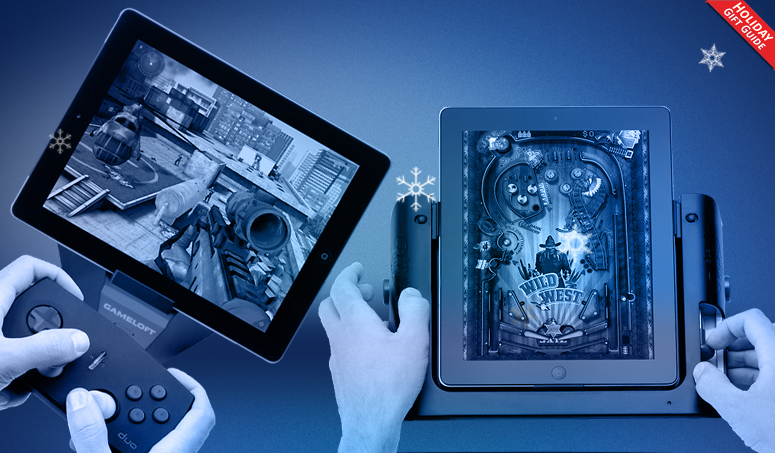 The iPad is a great gaming platform thanks to its high-resolution screen and powerful graphics performance. Still, you do lose a little something when games are all controlled with the swipe of a finger. And iPads also tend to make gaming a solitary experience. During the holidays, playing alone just shouldn’t be an option. These toys, controllers, and accessories will take your iPad gaming experience to the next level. 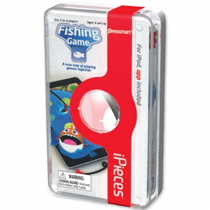 They make great gifts for yourself or any iPad owner in the family. A word of advice: protect your iPad from gaming related mishaps and other dangers with a rugged case and screen protector. We’re fans of the Defender case by OtterBox, LifeProof’s nuud for iPad, and this Fisher-Price baby-safe case. Into head-to-head trivia games with the family? Then this is the perfect add-on for your iPad. The Duo Pop’s clickers record which player or team is the first to buzz in with the answer, just like on TV. It works with five different games, all available in the App store. Kids age 4 and up will appreciate this digital update on an old favorite. The Fishing Game works just like its mechanical counterpart: use a magic plastic rod to catch fish and drag them to your bucket. Just watch out for the sneaky heron – he’ll steal your catch if you’re not careful. Complex games look stunning on the iPad, but if the on-screen controls leave you wanting more (or in fear you may crack the screen in a moment of excitement…) check out the Duo Gamer. 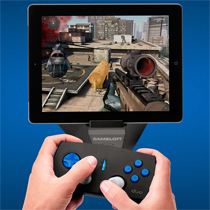 This Apple-approved Bluetooth controller for the iPad works with Modern Combat 3, Asphalt 7, and many other Gameloft games. Thanks to the controller’s two analog joysticks, four buttons, D-PAD, and two triggers, you’ll get a console-style feel while playing on your tablet. Love the idea of a controller but want something old school? The people who brought you the iCade iPad Arcade Cabinet have your back. 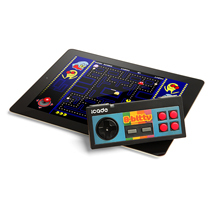 Think Geek’s 8-Bitty Bluetooth controller is reminiscent of the original Nintendo controller and works with the same vast 150+ retro game library as the original iCade. Going back even further, remember when arcades were all about the pinball machines? The tactile joy of slamming buttons to control the flippers is now available for the iPad thanks to the Duo Pinball machine. It even has a plunger for shooting the ball. Your iPad will stay steady as you play in your lap or on a tabletop, so keep it on the coffee table or in the back of the car to entertain kids on long trips. 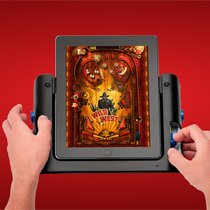 Works with the Pinball HD app, which includes five different table styles for free. 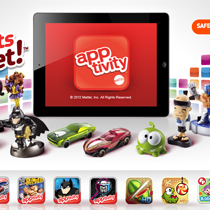 Familiar games like Angry Birds, Cut The Rope, and Fruit Ninja get a whole new level of gameplay with Mattel’s Apptivity figurines. 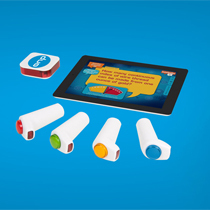 Each toy works with a specific game, and unlocks special features when placed on the iPad’s screen. Engage in two-player fun in Fruit Ninja or get on the pig’s side in Angry Birds. 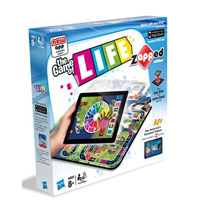 Expand beyond familiar games with Apptivity’s other toys ranging from Batman and WWE superstars to Monster High characters, all with their own apps. Fans of HeroClix will appreciate this digital update to the figurine-based fighting game. 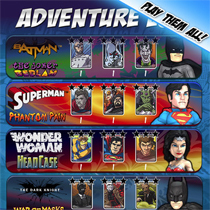 Special TabApp versions of Marvel and DC heroes interact with the new HeroClix app, which adds a new dimension to the game. Navigate through dungeons and other environments to battle enemies using special powers. Each character gets his or her own storyline and challenges, offering hours of gameplay (with more to come). While you can’t use your existing HeroClix figures with the iPad game, TabApps toys are compatible with regular tabletop play. Adult artists use the iPad for sketching, so why shouldn’t kids? It’s less messy than crayons or paint, and they can create masterpieces even while traveling. Crayola’s coloring apps make a great canvas, now you just need the right tools. 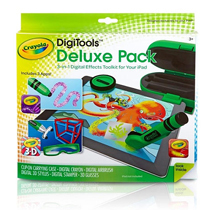 This set includes a digital crayon, digital airbrush, a stamper, and a 3-D stylus for creating drawings that pop off the screen. 3-D glasses are included.